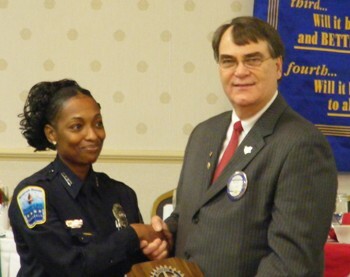 The Rotary Club of Portsmouth meets every Thursday at 12:30 pm at Roger Brown's Restaurant and Sports Bar, 316 High Street, (757) 399 5377 in downtown Portsmouth. The meeting begins with a buffet lunch. Members are encouraged to get to know each other better by choosing to sit with different members each week. An invocation and Pledge of Allegiance and some light-hearted singing led by Rotarians open the business portion of the meeting. Visiting Rotarians and guests are recognized, followed by a small amount of club business that usually includes discussion about and recruitment for our various community projects. The major portion of the meeting is then turned over to the program. Our programs are presented by speakers who have been chosen in advance to inform or entertain those present. Meetings end promptly at 1:30 pm. 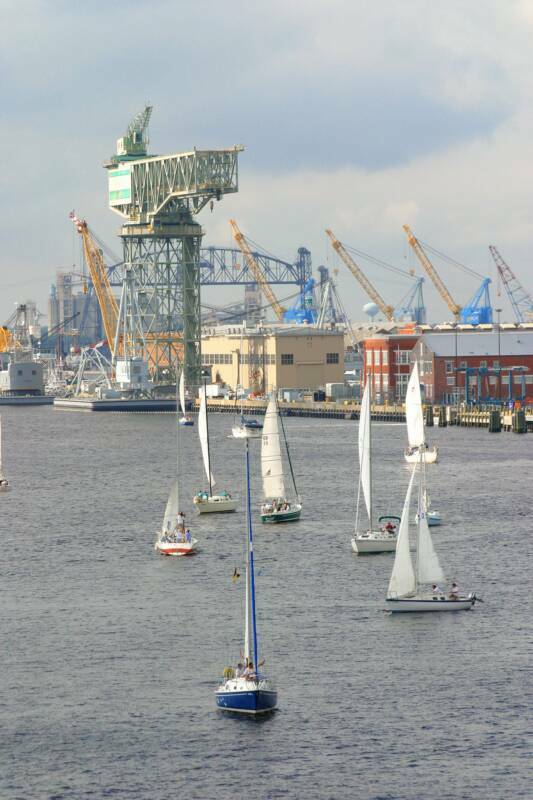 WHAT SERVICES DO PORTSMOUTH ROTARIANS PROVIDE? Paint Your Heart Out, a service that assists elderly homeowners with exterior painting and yard maintenance. The Rotary Bookshelf at the Portsmouth Public Library. Each Rotarian donates a book on his or her birthday. More than 6,200 books have been donated in the past 50-plus years. The Dictionary Project which each year provides a free dictionary to every third grade student in the public and private schools in Portsmouth. Volunteers for Meals On Wheels·, a program which helps older adults remain independent as long as possible by delivering nutritious and well-balanced meals to the homes of persons 60 and older who are unable to cook for themselves. STRIVE, a high school level program that promotes achievement in students who are at-risk academically. Each year, our Club awards scholarships to deserving STRIVE students who attend Tidewater Community College. Interact Clubs at both Portsmouth high schools. These are student clubs that instill and support Rotary ideals. Awarding college scholarships to graduating seniors in each of the Portsmouth high schools. Providing Christmas presents to residents of Holiday House and EDMARC. Annual recognition of outstanding city public safety employees and recognition of Armed Forces members. Financial support for many local organizations such as Girl Scouts, Salvation Army, Holiday House, Red Cross, Chesapeake Bay Foundation, Special Olympics, Medication Access Program, and many others. Sponsor various fundraising activities including the Annual Rotary Bar-B-Que to support local needs and international service projects through the Rotary Foundation. J. R. St. George, Sr.
Mrs. C. E. Russell, Sr.
Mrs. B. W. Foster, Sr.
J. R. St. George, Jr.
Paul Harris Fellows are those Rotarians who have given or in whose honor has been given at least $1000 to the Rotary Foundation for its charitable purposes. 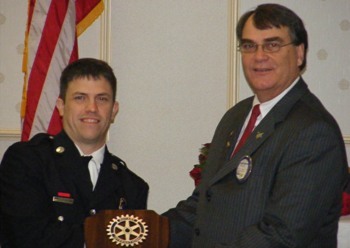 A Rotarian may give in honor of someone else who may then also become a Paul Harris fellow. As a Rotarian’s subsequent gifts to the Foundation reach multiples of $1000, he/she becomes an advancing level Paul Harris Fellow. The Rotary Club of Portsmouth currently helps members reach their first level Paul Harris Fellow designation by matching up to $500 of the member’s contribution to the Foundation. Since those funds come from our weekly raffle, the availability of the funds is not guaranteed. James A. 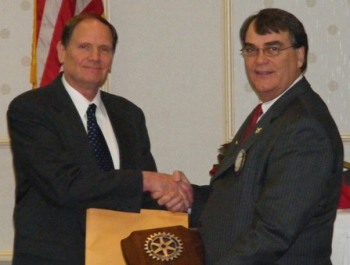 "Jac" Cales, Jr.
Each year, the outgoing President selects one Rotarian who has demonstrated above-expectation devotion to and performance of the ideals of Rotary. Our club dues are currently $800 annually, payable quarterly. The dues cover the cost of the weekly lunch for members, certain social events, the club’s administrative expenses, and our District and International dues. In addition, each member receives Rotary International’s monthly magazine, The ROTARIAN. 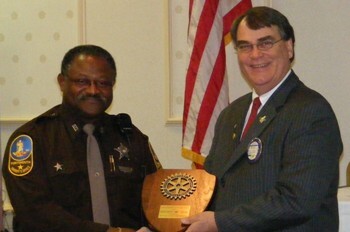 Rotary membership is by invitation only. Members are chosen to represent their respective businesses or professions and to reflect the gender, ethnic and general population of our area. The Classification Principle of club membership ensures that members will represent a broad range of the business and professional community to reflect the makeup of their communities. Please watch the video below to gain a basic understanding of Rotary. 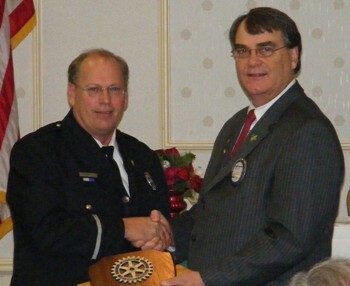 During our December 6, 2007 meeting, President Ray McInnis presented awards to Public Safty workers in the city of Portsmouth. Front upper left to lower right, they are Sherriff's Department, Fifrefighter, Police Detective (center), Paramedics, Regional Corrections.